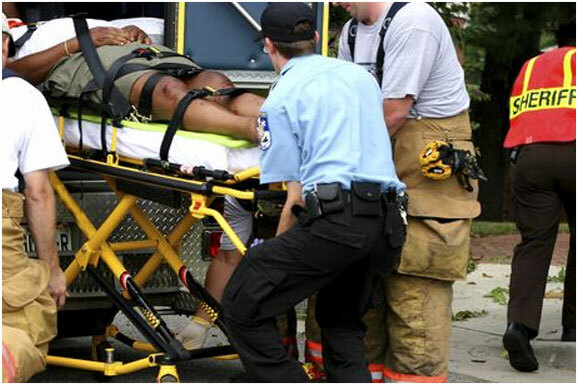 Have you experienced an accident and need trauma cleanup services? Call Iowa CTS Cleaners NOW! Iowa CTS Cleaners relieves homeowners, property managers, co-workers, families and/or friends from emotional trauma and hazards associated with cleaning a trauma scene area. We advise that family, friends, co-workers etc should not try to cleanup a trauma scene due to biohazards and the emotional pain associated with the victims. We provide strict privacy for any cleanup at a trauma scene and drive un-marked vehicles to a scene. We work with all insurance companies if insurance is used as payment for trauma cleanup. Beware of NON-local crime scene cleanup companies that advertise on the internet and appear local. Hire a locally based certified and qualified professional - Hire Iowa CTS Cleaners! 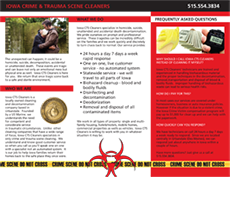 Contact your local trauma scene cleaning service, Iowa CTS Cleaners to professional remediate biohazards associated with a medical emergency of any kind to a pre-trauma scene condition. We are locally owned and operated and our biohazard team of technicians will provide understanding to any concerns related to a trauma cleanup as well as privacy for all work performed.